Beyonce was titled as the highest paid female musician in 2017 according to the latest Forbes list. 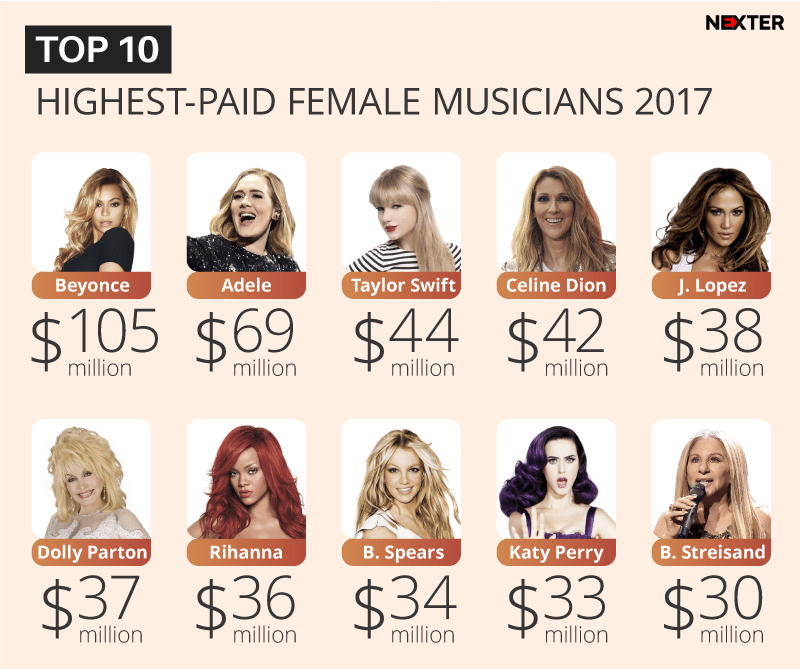 Forbes published their traditional list of The World’s Highest-Paid Women In Music 2017. R&B Queen Beyonce topped the list and has edged out Adele and Taylor Swift. As it was reported, the ‘secret’ of her success was the release of the sixth studio album ‘Lemonade’, despite she didn’t get Grammy for Album of the Year. Also her Formation World Tour in 2017 grossed a quarter billion dollars. This year Beyonce (and Jay Z) got even bigger award – as she became a mother of twins Rumi and Sir in June. Then goes Adele, earning $69 million. Her ’25’ album broke first-week of the US sales records in 2015. Taylor Swift occupied the third spot with $44 million as her new album Reputation was announced as the best-selling album of 2017. Celine Dion ($42 million) and Jennifer Lopez ($38 million) rounding off the Top 5 with rank fourth and fifth, respectively.